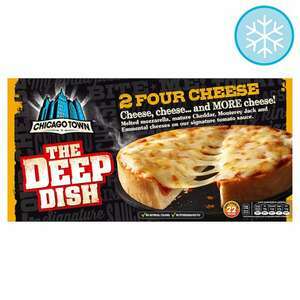 Chicago Town Club Pizza is currently 1/2 price at Tesco and also some of the flavours on 1/2 price at Morrisons. Is this the microwave ones? If so then they're Ok when you're in a rush. Microwave (From Frozen): Remove all packaging and place pizza on the microwave disc (silver side up) on a microwave-safe dinner plate. Microwave on full power: 750W or D, Heat on full for: 3 1/2 mins, Stand for: 1 min. Microwave on full power: 850W or E, Heat on full for: 3 mins, Stand for: 1 min. They are very hot but if you can wait for them to cool a bit they're not too bad.